"Well, you know what happens now?" 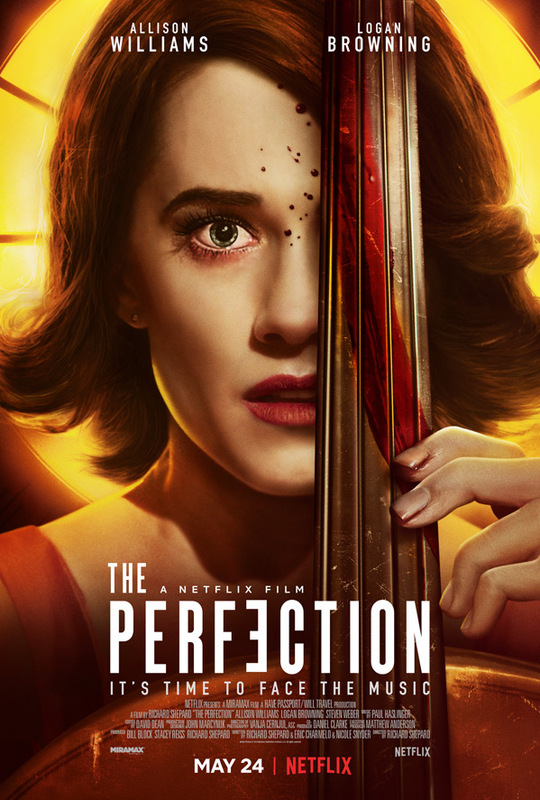 Netflix has debuted an official trailer for an acclaimed indie horror thriller titled The Perfection, from director Richard Shepard (The Matador, The Hunting Party, and Dom Hemingway). This premiered at Fantastic Fest last year to rave reviews, hailing it as one of the most unique and original horror projects to play at the festival that year. Described as a shocking "cellist feud" film, it's about two rival prodigy musicians who get into some big trouble when they go at each other in sinister ways. Allison Williams stars with Logan Browning, and a cast including Steven Weber, Alaina Huffman, Glynis Davies, and Winnie Hung. This is one of those films that is best seen without having watched any footage before, but if you need to be convinced the trailer shows just enough to get your undivided attention. The Perfection is an elegant and terrifying suspense ride filled with unexpected twists and turns. When troubled musical prodigy Charlotte (Allison Williams) seeks out Elizabeth (Logan Browning), the new star pupil of her former school, the encounter sends both talented musicians (cellists) down a sinister path with shocking consequences. The Perfection is directed by Emmy and DGA Award-winning American filmmaker Richard Shepard, director of the films The Linguini Incident, Mercy, Oxygen, Mexico City, The Matador, The Hunting Party, and Dom Hemingway. The screenplay is co-written by Eric C. Charmelo and Richard Shepard and Nicole Snyder. This originally premiered at Fantastic Fest last fall. Netflix will release Richard Shepard's The Perfection streaming exclusively starting May 24th next month. Who's planning to watch?